In our American society, excessive waste it seems is a by-product of our excessive lifestyles. We go to the store and allow the cashier bag the one item we just purchased that we could have easily just carried out on our own without any regard for the plastic bag we just guaranteed a place in a landfill. I'll never forget a trip to Target over Christmas when my husband and I were purchasing a few small items. When I realized the cashier put the items in a plastic bag, I said, "Oh, we don't need a bag, we can just carry them ourselves," she proceeded to take the items out of the bag and then THROW THE BAG AWAY!!! I wanted to castigate her for such thoughtlessness, but alas, I didn't want to make a scene, so I proceeded to grumble under my breath to my husband, "Well we may as well have just taken the bag if she was going to throw it away." Even before watching the Food Network special, I had become quite vigilant about finding ways to repurpose leftovers in my fridge to make them into new and exciting meals. It's like my own mini Iron Chef battle with myself. 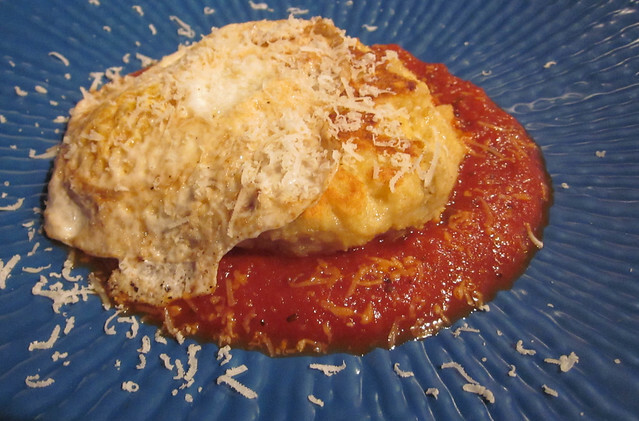 One of my favorite repuroses for mashed potatoes is to make Giada DeLaurentiis's dish, Eggs in Purgatory which is a fried egg and a potato pancake lying on a bed of marinara sauce. Where most people throw away leftover mashed potatoes or, at best, reheat them in a pot with a little extra milk, I have found it an extremely satisfying challenge to find a way to make a whole new meal out of them (loaded baked potato soup is another favorite reuse). 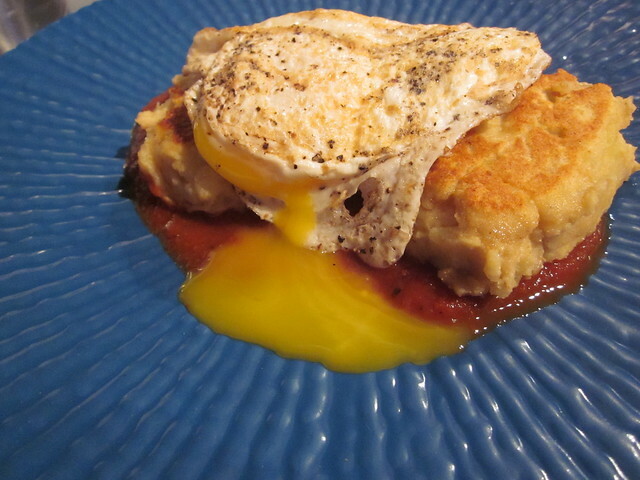 Add potato pancake to a bed of marinara and top with fried egg. Dust with parmigiano-reggiano. So the next time you're cleaning out your fridge and about ready to throw out some perfectly good leftovers, why don't you dig deep and ask yourself, "Can I do something else with these to make them into a whole new dish?" Your wallet and the planet will thank you. ETA: I should note that I have no idea if the book American Wasteland gives any advice on how to repurpose leftovers since I haven't read it yet. I merely mentioned it in this post as a way to refer to the vast amount of food waste in this country. I have challenged myself in my own kitchen to find ways to reuse leftovers to reduce the amount of food waste in my own house. I just love cooking with leftovers :) Making these kind of dishes like above are my favorite :) Thanks for sharing! I saw that Food Network special, and it made me more conscious of throwing food away. I even try to pick up some of the less-than-perfect produce items and leave the perfect ones for pickier people... otherwise, those imperfect pieces would be thrown away. I like that you call repurposing leftovers your own mini Iron Chef challenge. I'm one of those who simply tries to re-eat leftovers until I'm so sick of them, I can't fathom another bite! I'll definitely have to check out the book as well! American Wasteland is an absolute eye-opener of a book, for so many reasons. It was one of my top nonfiction reads of 2011, and it is one that I think everyone could benefit from reading. It has changed how I view our food waste and while I'm not perfect or as diligent as I would like to be, I'm much more conscientious. I am one of those people who thinks things ALWAYS taste better when it is leftover or made out of leftovers! I guess I would be a natural to like this book! These sound yummy. I totally agree about the egg. Delicious! Mashed potatoes also make a good pie topping instead of pastry. I always think of shepherds pie when mashed potatoes comes up. That looks delicious. 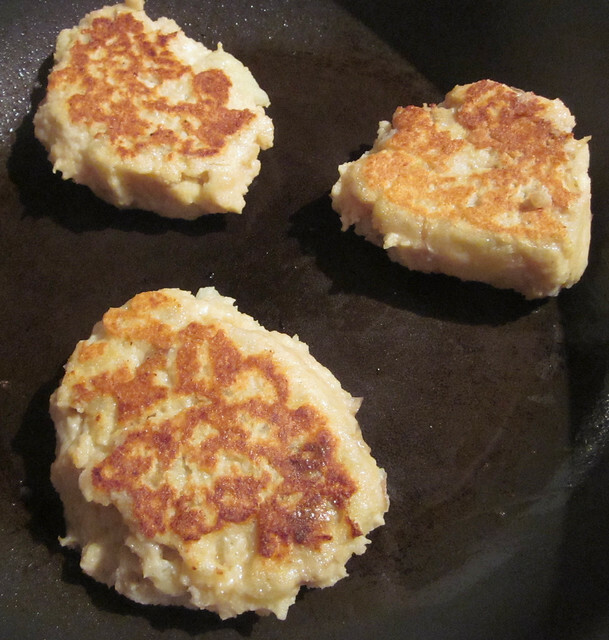 I am always leery of making mashed potatoes because I never know what to do with the leftovers! Perfect solution. According to my mom, during the war years,they called this "chain cooking." Her mom would make a big meal on Sunday, and the leftovers would appear in different forms until they were gone. I couldn't agree with you more. Leftovers are forever showing up in pancakes or soups on our house. 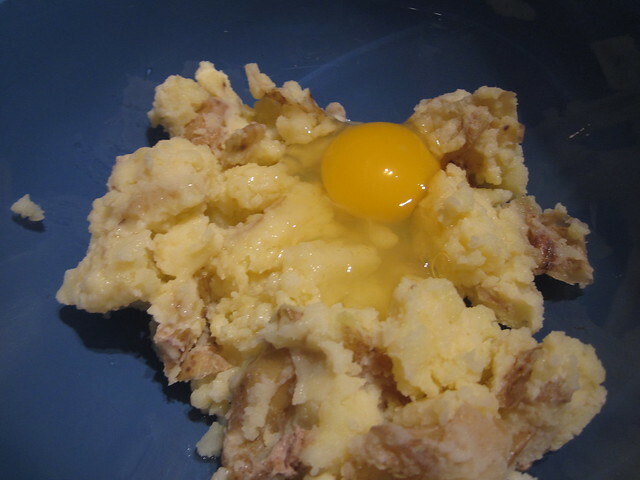 And adding a fried egg repurposes almost anything. I love leftover chili on a tortilla with an egg for breakfast! Thanks for the great post. Yes, I'm a big lover of adding leftovers to soups. I also like having a fridge clean-out day where I use a bunch of random items and make a fritatta out of them.